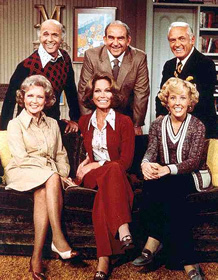 Performers include: Mary Tyler Moore, Gavin MacLeod, Edward Asner, Ted Knight, Valerie Harper, Georgia Engel, Betty White, and Cloris Leachman. Single woman Mary Richards (Mary Tyler Moore) moves to Minneapolis, Minnesota to get a fresh start after breaking up with her boyfriend of two years. She moves into an apartment in a large house that’s managed by her self-involved friend, Phyllis Lindstrom (Cloris Leachman). Mary initially conflicts with her self-deprecating upstairs neighbor, Rhoda Morgenstern (Valerie Harper), but they later become best friends. Mary finds a job working as an associate producer for the six-o’clock newscast at the local WJM television station. She works under gruff producer Lou Grant (Ed Asner) and sits next to long-suffering news writer Murray Slaughter (Gavin MacLeod). They’re all constantly frustrated by the antics of pompous and buffoonish news anchor Ted Baxter (Ted Knight). Later characters include the man-hungry host of The Happy Homemaker program, Sue Ann Nivens (Betty White), and sweet-natured and naive Georgette Franklin (Georgia Engel), Ted’s eventual wife. During the run of the series, Leachman and Harper left for their own spin-offs — named Phyllis and Rhoda, respectively. After the end of The Mary Tyler Moore Show, Asner continued to play his character in a spin-off drama series, Lou Grant.